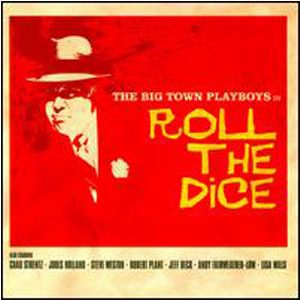 The Big Town Playboys are a six-piece acoustic British rhythm and blues revival group. Founded bu Ricky Cool and Andy Silver in 1984, they covered American music from the 1940s and 1950s, such as that of Amos Milburn and Little Walter. The Big Town Playboys have released a series of studio albums, as well as a series of studio albums, as well as a collaborative project with Jeff Beck (entitled “Crazy Legs”), re-creating the songs of Gene Vincent. Several of their songs also appeared on the soundtrack of the film, “The Pope Must Die”. They have performed as a backing band for Robert Plant, who contributed guest vocals on their album “Roll the Dice”. They also performed together at the Birmingham Heart Beat 86 charity concert. Eric Clapton had expressed admiration for their work, arranging for them to open for them work, arranging for them to open for him during his two week long stint at the Royal Albert Hall in London in 1996. In May 2005, the band teamed up with Gary Brooker and Andy Fairweather Low to give a charity concert called “Aftershock” in India, with all proceeds to benefit victims of the tsunami caused by the 2004 Indian Ocean Earthquake.